In the period of 2003-2005, an armorial roll was assembled for members of the Canton of Whyt Whey by Doña Sancha de Flores. The pages were preserved at archive.org (1, 2) and I thought they might be interesting as a snapshot of local participants from that time. Attached below is Doña Sancha’s roll as of 2005; sadly, several of the emblazons were not preserved by the archive. 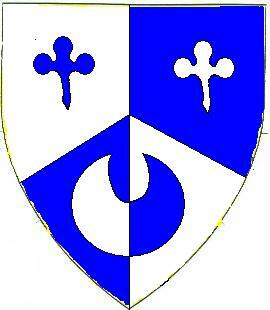 Blazon: Argent, a trefoil slipped azure between in chief two crosses swallowtailed gules. 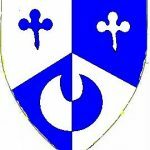 Blazon: Or, a triple branched candlestick sable, on a chief azure a mullet of eight points Or. Blazon: Vert, on a bend argent between two plates three lions rampant palewise vert. Blazon: Lozengy sable and ermine, a baton sinister gules. Blazon: Azure, chape argent, three legs flexed and conjoined in pall at the hip Or, a base argent. Registered: Name registered April 2003. Registered: Name registered November 2002. Arms registered October 2003. Blazon: Azure, a crescent inverted between two piles inverted argent, each charged with a crescent inverted azure. Blazon: Or, an abacus sable, a chief rayonny gules. Badge: (Fieldless) An abacus sable.